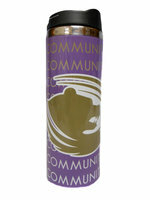 Stainless steel tumbler with repeating "Butler Community College" down the length of the tumbler and a large Grizzly in the middle. Designed for hot and cold liquids. 16oz Carnival Cup with gold, purple and white polka dots. 12oz Heavy-duty ceramic mug with lid. Choose from Purple or Black. 24oz Purple Plastic Tumbler with large "B" and "Butler" imprinted in white down the length of cup. Great for tailgating! 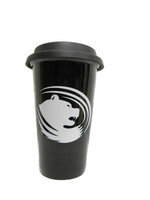 14oz stainless steel tumbler with faux leather sleeve. Tone on tone imprinting. Choose from purple or brown. 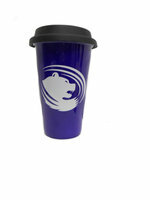 14oz stainless steel tumbler with "Butler Grizzlies" imprinted on top half. Top half purple / bottom half stainless steel. For hot or cold liquids. 28oz Butler Blender Bottle with ball whisk. It's perfect for mixing everything from creamy smooth nutrition shakes to salad dressings, marinades, and fluffy omelets. It also makes a great water bottle. Simply drop the "Blender Ball" wire whisk into the Blender Bottle along with your ingredients, screw on the lid, press down the flip top, and shake! Large black soup mug "Butler Grizzlies" embossed on the outside. Choose either green or orange inside. 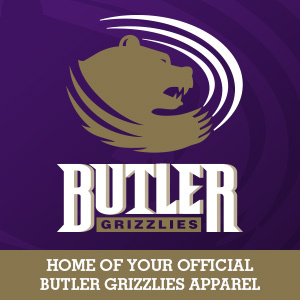 40 oz stainless steel bottle "Butler Grizzlies" imprinted in white wrapped around the bottle. Available in silver, purple or black. Please specify color in the comments.